Permethrin 13.3%, a member of the Martin’s® family brand of products, a multi-use insecticide with an expanded label. 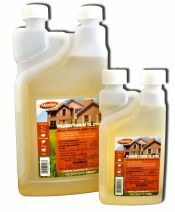 Permethrin 13.3% has all the same great labeling as our old standby, Permethrin 10%, but it contains 33% more active and does not have “Commercial Applicator” or Ag Use Requirements language. Additional applications include spot treatment of mattresses for bed bugs, grain insects, and carpet treatment applications for carpet beetles as well as outdoor residential and animal housing misting applications (automatic and handheld misting foggers).